Just like a good dinner party starts with the guest experience before deciding on the food or the plates to serve up the food, within a digital strategy, we consider the goals first and then discuss infrastructure, platforms, social interactions and measurement tools. Very often, businesses will request a social media strategy. We take a broader view and include social media as part of an overall digital strategy that operates as part of an integrated marketing communications plan. A digital strategy is about telling your stories and building your messages on-line so your target can find you. A digital strategy starts with an audit to determine where the opportunity for growth is in your market. A strong content strategy then defines the actions and the content experience. If your product is an iPhone application for healthy living, the brand and therefore the content strategy will be different from an RFID product. We consider social media contesting and promotions as methods to achieve strategic business goals rather than just ways to quickly get some traction in a market. 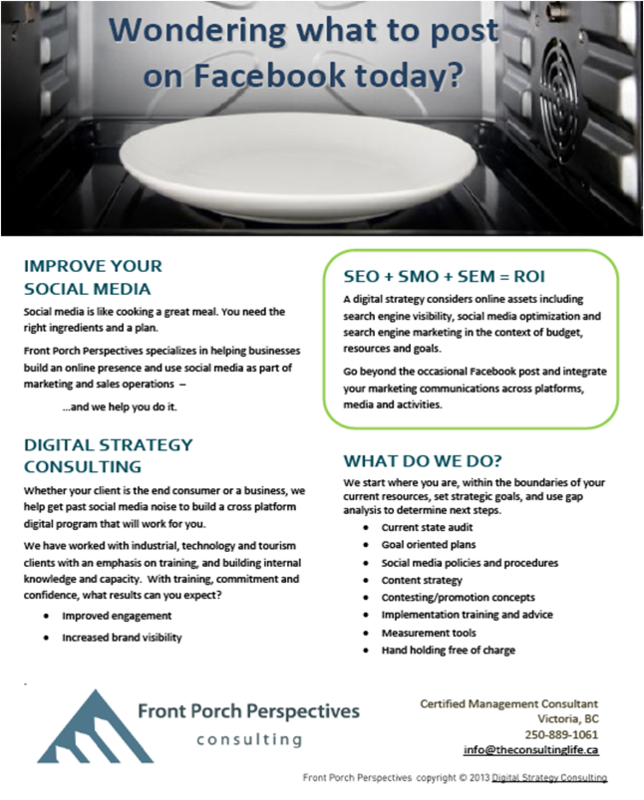 Click image below to download Online Strategy brochure.